It is that time again — the annual Border War football game between Wyoming and Colorado State. The two teams meet for the 110th time at 8 p.m. Friday at CSU’s Canvas Stadium. 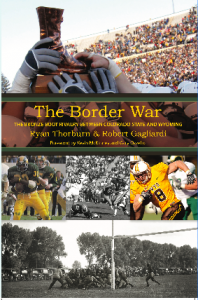 It is a great time for both Cowboys and Rams fans to get a copy of “The Border War” book co-authored by myself and Ryan Thorburn. The book depicts the long history of this rivalry, and includes some of the most memorable games and participants in this rivalry — the longest continual college football rivalry west of the Mississippi River. I will be signing books from 4-6 p.m. Friday at the CSU Bookstore in the Lory Student Center. Hope to see a lot of Cowboys and Rams fans there. I may be a little biased, but it is a must-read for fans of both schools. And, if you are looking for a gift for fans of either school, this is a great opportunity to get a book.